Frequenters of the open road are naturally apt to associate the word Scout with the figure – once, at any rate, familiar – of the A.A. man. 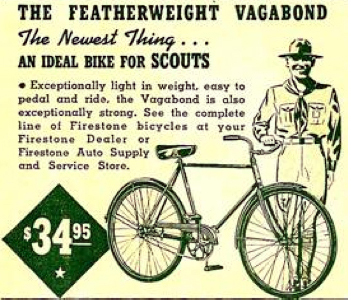 Possibly many wheelmen do not realize to what a great extent cycling and its allied pursuits are being encouraged by the Boy Scout movement. 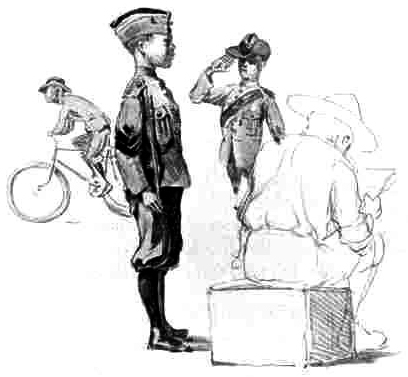 It is significant that one of the very first sketches in ‘Scouting for Boys’ depicts Lord Edward Cecil and some cyclist Boy Scouts in Mafeking …Sir Robert Baden-Powell refers to the splendid work of the boy cyclists in maintaining a postal system between the various forts even amidst danger. The illustration above is by Baden-Powell, sent out of Mafeking by native runner on 19th April, 1900, and published by the London Daily Graphic on 16th June, 1900. Robert Baden-Powell became a national hero in 1900 for his 217-day defense of Mafeking in the Boer War. 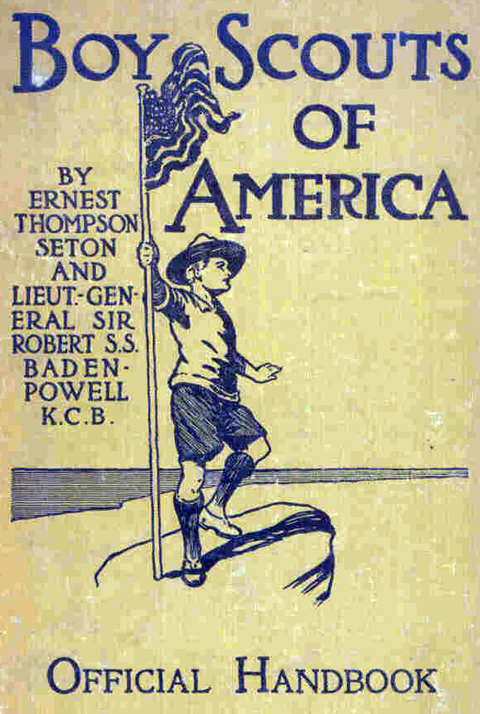 Aids to Scouting, a military field manual he wrote for British soldiers in 1899, became a big hit with the youth of Great Britain, who loved the lessons on tracking and observation; they organized elaborate games using the book. 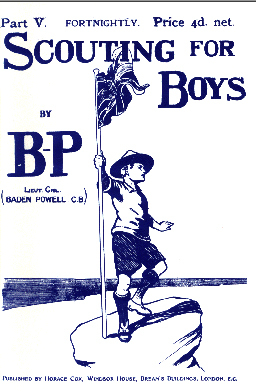 So Baden-Powell decided to write a non-military field manual for boys that would also emphasize the importance of morality and good deeds. 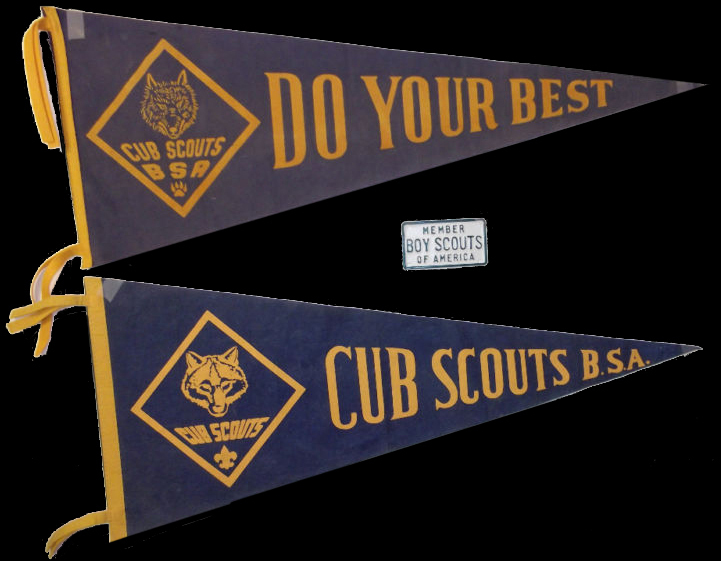 On January 24, 1908, the Boy Scouts movement sowed its seeds in England with the publication of the first installment of Scouting for Boys. Thousands of youngsters bought the handbook. 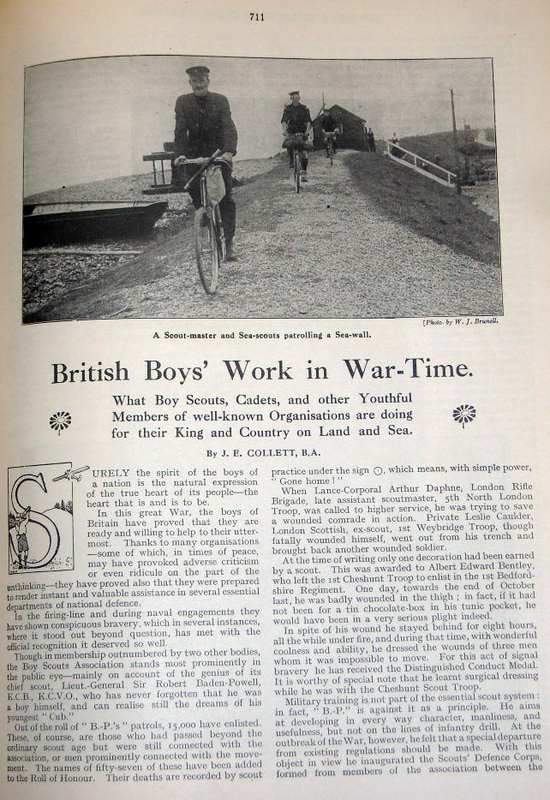 By the end of April, the serialization of Scouting for Boys was completed, and scores of impromptu Boy Scout troops had sprung up across Britain. 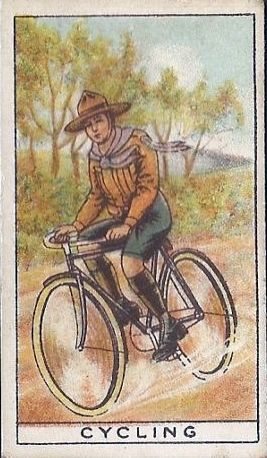 The 1911 photo below shows a boy scout cycle messenger in 1914. 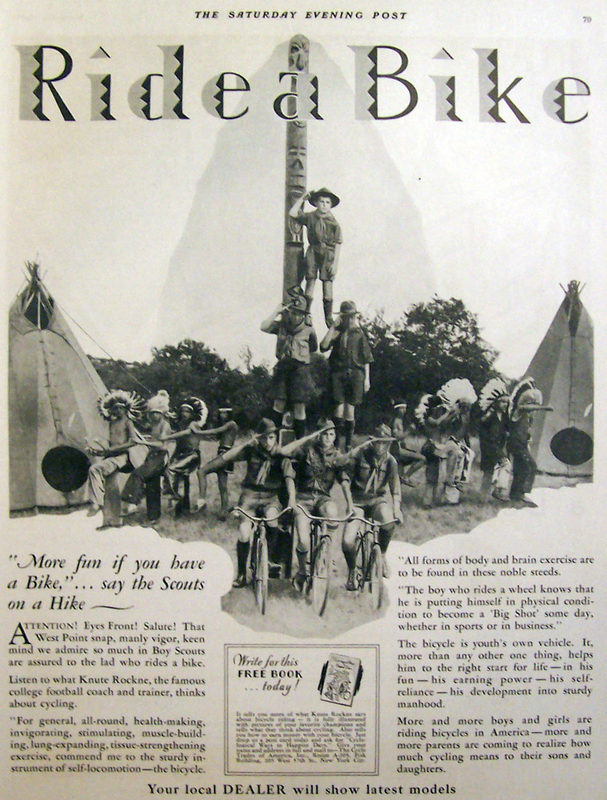 Baden-Powell was against the idea of military training for scouts, but at the outbreak of WW1 he felt that ‘a special departure from existing regulations should be made.’ So he inaugurated the Scouts Defence Corps. You can see details below. WW1 had, of course, been an ultimate test of doing your best for fellow humanity. Upholding the ethics of scouting had moved into public consciousness. 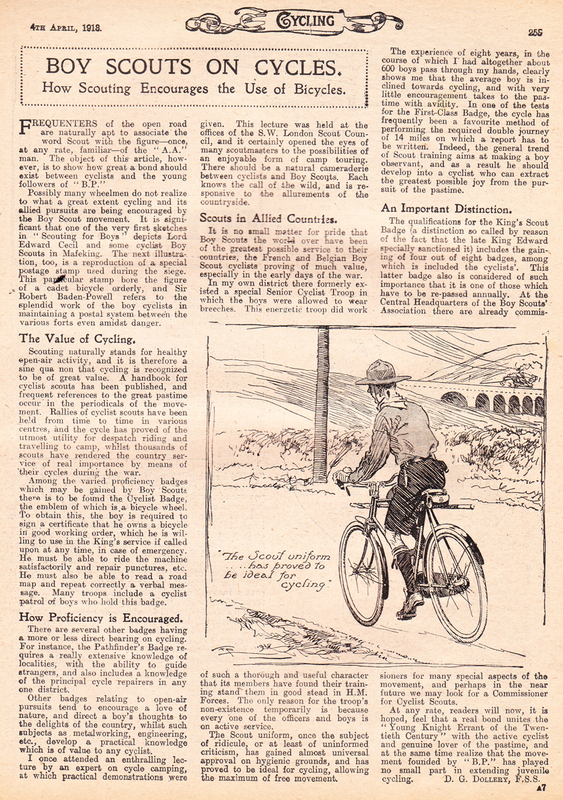 Cycling had also become a mainstream necessity, rather than a pre-war hobby. 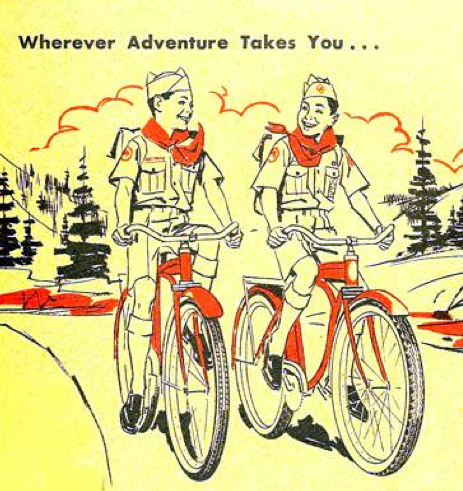 After the war, the scout movement was firmly entrenched in society, and cycling became an integral part of scouting. 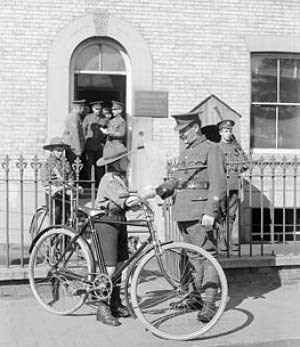 I find it an interesting coincidence that the initials BSA are shared with the American scout movement, because Baden-Powell had also been instrumental in campaigning for the employment of bicycles by the military, and Birmingham Small Arms Ltd made the majority of British military bicycles. 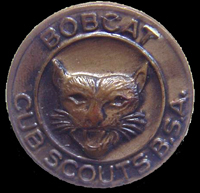 BSA – Boy Scouts of America – was incorporated in America in 1910. The 1910 Handbook (now known as the Original Edition), is seen below. 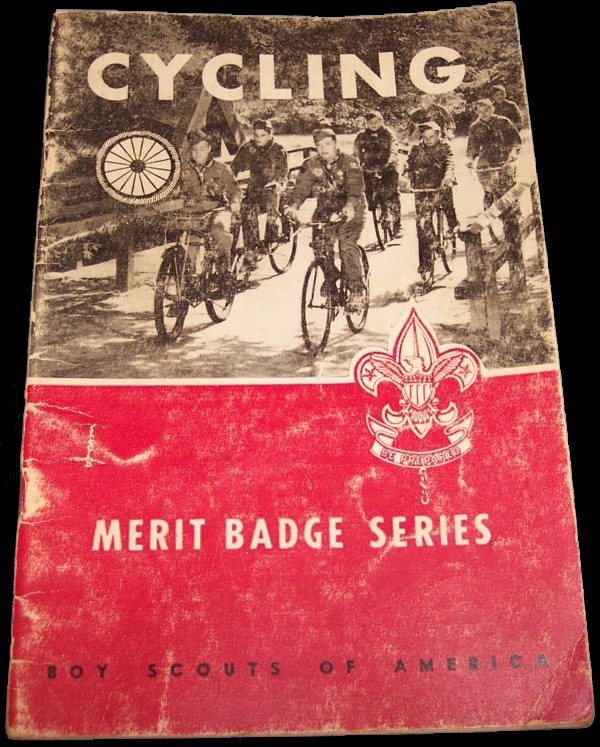 The Scout Movement, of course, has probably done more than any other body in the twentieth century to instill the advantages of cycling into young people of the world.